Have you as most grown weary of hearing about Bill and Hillary Clinton, the Clinton Foundation, (even Chelsea) and all the Clinton scandals? Are you like most astonished at the fact that with all the exposed corruption, unethical actions that have been sometimes illegal actions, misuse of government information, quid pro quo with donors from all over the World — campaign donors AND “donors” to the Clinton Foundation for “worthy” causes — and “Pay to Play” schemes, stupid operating decisions regarding the United States classified information, Bill is the only one who has paid a price for any of this? And even then, he was impeached as a direct result of not any wrongdoing as President or the governor of Arkansas, but for lying under oath in a civil trial! 1. Monica Lewinsky: Led to only the second president in American history to be impeached. 2. Benghazi: Four Americans killed, an entire system of weak diplomatic security uncloaked, and the credibility of a president and his secretary- of-state damaged. 5. Whitewater: A large S&L failed and several people went to prison. 6. Travel-Gate: The firing of the career travel office was the very first crony capitalism scandal of the Clinton era. 7. Huma-Gate: An aide’s sweetheart job arrangement. 8. Pardon-Gate: The first time donations were ever connected as possible motives for presidential pardons. 9. Foundation favors: Revealing evidence that the Clinton Foundation was a pay-to-play back door to the State Department, and an open checkbook for foreigners to curry favor. 11. File-Gate: The Clinton use of FBI files to dig for dirt on their enemies. 13. The Waco tragedy: One of the most lethal exercises of police power in American history. 15. Trooper-Gate: From the good old days, did Arkansas state troopers facilitate Bill Clinton’s philandering? 17. 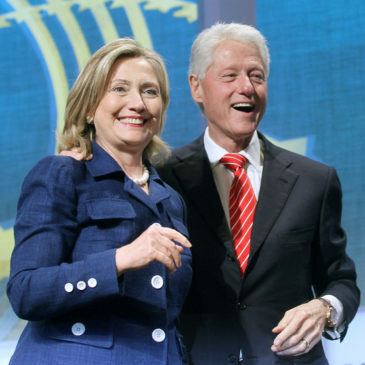 Bill’s Golden Tongue: His and her speech fees shocked the American public. 19. Larry Lawrence: How did a fat cat donor get buried in Arlington National Cemetery without war experience? 20. The cattle futures: Hillary as commodity trader extraordinaire. 21. China-Gate: Nuclear secrets go to China on her husband’s watch. The investigation looking into the possible pay-for-play interaction between Secretary of State Hillary Clinton and the Foundation has been going on for more than a year. Led by the white collar crime division, public corruption branch of the criminal investigative division of the FBI. The Clinton Foundation investigation is a, quote, “very high priority.” Agents have interviewed and re-interviewed multiple people about the Foundation case, and even before the WikiLeaks dumps, agents say they have collected a great deal of evidence. Pressed on that, one source said, quote, “a lot of it,” and “there is an avalanche of new information coming every day.” Some of it from WikiLeaks, some of it from new emails. The agents are actively and aggressively pursuing this case. They will be going back to interview the same people again, some for the third time. As a result of the limited immunity deals to top aides, including Cheryl Mills and Heather Samuelson, the Justice Department had tentatively agreed that the FBI would destroy those laptops after a narrow review. Word is “definitively,” that has NOT happened. Those devices are currently in the FBI field office in Washington, D.C. and are being forensically examined. Whether they contain classified material or not is not yet known. But apparently, it will likely be known soon. So why is it that those in the political and American Justice Systems have given the Clintons pass after pass for their wrongdoing through the years? The answer can be only one of — or maybe both of — these two reasons: the Clintons have a “retribution machine” they have effectively used through their decades in power in Arkansas and D.C. to discourage anyone from going against them in any way. That could explain how and why they seem to be made of Teflon: nothing sticks. Knowing which closets of one’s enemies hold skeletons can be a very valuable tool to use to demand and hold the loyalties of political insiders. Having that information works well to tamp-down the temptation for payback. The second could be that Leftist politicals in the U.S. seem to thrive on partial truths and good sounding stories instead of demanding “the rest of the story.” To that end, one can see and understand how the Media seem to bow at the altar of Clintonism, jealously protecting their hero and heroine from the screams from underling Americans who are unworthy to breathe the same air as Bill and Hillary. How dare the American public want to know all there is to the Lewinsky scandal that resulted in Bill’s impeachment, what really happened in Benghazi, the Whitewater affair in Arkansas, Hillary’s commodity trading financial windfall, the deaths of approximately 60 Clinton underlings who died through the years under extremely suspicious circumstances during or after voicing a desire to press the Clintons on certain matters? Both Clintons will probably go to their graves having lived the words “Payback is Hell” brutally executed on their foes more than any other political power players in U.S. history. It seems to this writer that even when obvious facts are thrust into the eyes and ears for all Americans to consume, Democrats assume that just because (in this case) the Clintons wield so much power and have so many obligated “friends” in high places everyone must and will bow to the whims of the royal couple. And that theory has reaped dramatic political results for the Clinton duo throughout the last 3.5 decades. We listed only the names of the 21 scandals of the Clintons that everyone knows about to jog your memory. There are dozens of others, many of which are worse. Mention any of those publicly to initiate an explanation always results in a Democrat somewhere responding with, “That’s just a rumor. There’s no evidence that really happened.” Maybe the current confirmed investigation that is part of the “old” Clinton investigation will unearth and share with the world some of the unearthed evidence. There have been non-stop scandal investigations throughout American politics since the birth of the nation. Those are not rare. But it IS rare for so many scandals involving so many individuals, foreign countries, and corporations to be so closely guarded by those who fawn over Bill and Hillary — especially the Leftist Mainstream Media. But they’re smart: the Clintons know and understand better than most other Americans that when one has the ability to coax the MSM into what to cover and what not to cover using something or some “things” to elicit their cooperation, one can easily control and edit the media narrative one desires to impact what the American public learns about any specific topic. Come to think of it: the Clintons aren’t the only political leaders to so effectively do that. Hitler was surprisingly effective at literally controlling the media narrative — by force when necessary — to promote the Nazi agenda throughout Germany and the rest of Europe, purposely hiding the facts of scandal and travesty that occurred daily, while Hitler literally slaughtered millions of people. So what do you think this ongoing investigation into Clinton wrongdoing that certainly involve Hillary’s private email server and irregularities in the Clinton Foundation is going to reveal? To be honest, I think that will be determined not necessarily by facts, but by what skeletons the Clinton Group know of that belong to whoever is conducting this investigation! Remember this: in American politics, facts don’t really matter — no matter what any of us think. “Perception is reality.” And that’s how the Clintons have kept the truth captive so effectively for many years. Tell a pig enough times he’s a dog and he’ll eventually start barking. I’m not saying we are pigs or dogs, but we have seen many Americans swallow the Clinton narrative for so long without even asking questions. Why? Because Bill and Hillary (and now Chelsea) are so wily at spinning stories to a fawning populace, they have not only repeated the effective process over and over, Americans have bought it hook, line, and sinker. Will the merry-go-round ever stop? I don’t know. But maybe with the unsealing of some of those 63,233 sealed federal indictments, some from every one of the 50 states, several may be for William Jefferson, Hillary Rodham, and Chelsea. Oh, and for a point of clarification: that 63,233 number is 30 times more than have been issued during the same time frame at any time in American history. I don’t think that’s an accident. Remember: Attorney General Jeff Sessions announced in a 2018 letter to Congress that he had appointed federal prosecutor Jim Huber of Utah to continue investigations with unfettered cooperation from the 477 Justice Department investigators that were already being used by Inspector General Michael Horowitz. When you do that math, that means each investigator was responsible for just 132 of the indictments during the last 12 months.